Global Warming: A Storm in a Teacup? ​​Global warming is having an alarming effect on climate and weather events, with far-reaching consequences across the world. Nations the world over are being threatened with rising sea levels, floods, heat waves, droughts, hurricanes and severe storms. While the effects of these severe weather events are dramatic and tangible, and have a huge impact on human populations, especially vulnerable populations, there is another sinister effect of anthropogenic carbon emissions, together with global warming that is more subtle, less noticeable, but of equal, if not greater concern to scientists due to the implications for all life on earth. ​​An increase in greenhouse gases, particularly CO2, is responsible for global warming, which is ultimately the cause of climate change. An increase in global temperatures and the rise in atmospheric CO2 levels both have a significant impact on our oceans, and are bringing about dramatic changes in oceanic physical characteristics, which could have long-term irreversible implications both to the ecology of the oceans, and to the Earth as a whole. As our world gets increasingly warmer, the oceans do not go unaffected. Increased atmospheric CO2 levels and global warming are in fact double-edged swords that not only cause climate change through the obvious mechanism of rising global temperatures, but have the potential to radically alter ocean dynamics, with drastic environmental consequences. ​​C​​arbon dioxide dissolves in sea water and is absorbed by phytoplankton and used during photosynthesis. When these organisms die, they sink to the ocean floor, removing huge amounts of CO2 from the ocean surface and act as an effective carbon sink. However, levels of CO2 in the oceans are increasing, and the oceans are slowly reaching saturation point. Furthermore, CO2 dissolves more readily into cold water than warm water, and as sea surface temperatures are also rising, this further limits the ability of the oceans to reduce CO2 from the atmosphere. Consequently, the oceans are able to remove less CO2 from the atmosphere, and its role as a major CO2 sink is diminishing. ​​As CO2 from human activities permeates our oceans causing CO2 levels in the ocean to rise, the oceans are becoming more acidic. Changes in pH levels of the ocean and increasing acidity can drastically alter the marine ecosystem and its ability to support life, which could have significant implications for the future of marine animals and many terrestrial animals (including man) that depend on them for survival. Increased atmospheric temperatures are causing polar ice sheets to melt, resulting in higher sea levels, which threaten coastal communities. But the threat doesn't end there. Cold water is also denser than warm water, and consequently sinks. This difference is of great significance to the movement of ocean currents and ocean circulation. Warmer sea surface temperatures are having an effect on ocean circulation. This is exacerbated by the addition of cold water into the ocean as ice transforms to water with melting of polar ice sheets. Ocean circulation plays a critical role in climate regulation and weather patterns, and any alteration in ocean circulation can drive further climate change. Research has shown that ocean currents in the North Atlantic are slowing, which could potentially lead to devastating effects on climate. Rapid changes in ocean circulation, leading to a complete shut down or reversal of ocean gyres could result in rapid climate changes as experienced in previous ice ages. ​​On the surface, the oceans appear to be an unchanging constant that ebb and flow, moving in tune with the currents, and tides controlled by planets other than our own. They are beautiful and wild. They provide an abundance of diverse sea life, and reflect the epitome of natural harmony. But beneath the outer façade lurks a giant and phenomenal time-bomb that if set in motion could unleash the wrath of nature like we have never before witnessed in the modern age, wreaking havoc on our planet. Any surfer or sailor worth his salt will tell you that the ocean commands respect. It is bigger and more powerful than all of us put together. But this power goes beyond the waves and surface waters. The ocean is an unstoppable giant that, if messed with, has the power to affect the fate of our planet, and to drastically alter life on earth for a very long time. For this reason alone, CO2 emissions need to be curbed with immediate effect, if we want to prevent a complete planetary catastrophe. If we do not put measures in place to reverse this now, we may face the point of no return, putting the survival of life in the oceans and life on earth at immense risk. ​​Oceans and Climate Change: Carbon Sink or Carbon Source? Carbon dioxide in the Earth's atmosphere absorbs infrared radiation from the sun, and is essential for retaining heat to keep the Earth warm. However, a dramatic rise in carbon dioxide levels in the atmosphere from anthropogenic sources, particularly from the burning of fossil fuels, has led to global warming, and consequently, climate change. ​​Carbon dioxide is a gas that is in constant flux, moving freely between the atmosphere, the oceans, and the land. Of the three partitioning compartments, the largest portion of stored carbon dioxide is found in the oceans (93%), with the atmosphere storing the least amount of CO2. ​​​​The oceans store about 50 times as much CO2 as that stored in the atmosphere, and 19 times more than that stored in the land. The oceans have the ability to store much more carbon than the atmosphere and land due to the chemical processes that occur within sea water. 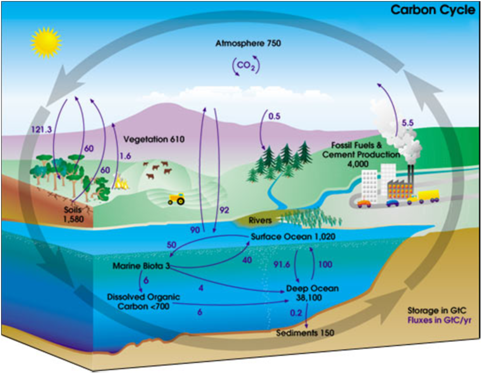 Carbon dioxide is broken down into carbonic acid, bicarbonate and carbonate when it reacts with water, and effectively reduces the CO2 gas content in the surface waters, allowing more CO2 to diffuse across the air-sea interface from a high pressure in the atmosphere to a low pressure in the surface waters. ​​Carbon dioxide moves between the sea and the atmosphere depending on the saturation levels of the surface water. ​​Therefore, as carbon dioxide is removed from the surface water by phytoplankton during p​hotosynthesis, it reduces the concentration of carbon dioxide in the surface waters and allows carbon dioxide to move across the water/air interface from a high concentration in the atmosphere to the sea water where concentrations are lower, until saturation is achieved. This is then made available to phytoplankton, and when conditions are favorable, a new cycle begins. ​​As primary producers, marine phytoplankton not only contributes extensively to productivity of our oceans, supporting an abundant array of marine life, but in the process, they also play a fundamental role in the carbon cycle, and in reducing carbon dioxide from the Earth's atmosphere. ​​Phytoplankton in the oceans absorbs carbon dioxide from sea water and converts this to carbon and oxygen in the process of photosynthesis. The carbon portion forms the basis of complex marine food webs, supporting the vast range of marine biodiversity found in our oceans. The oxygen released into the surrounding water by phytoplankton during photosynthesis is an essential component that is vital to the survival of all marine animals living below the surface of the oceans. Phytoplankton are found in abundance in the oceans, and as they comprise approximately half the plant matter produced on earth, they also assimilate half the CO2 released into the earth's atmosphere, essentially performing an equal function to all the plants, trees and forests on earth in terms of CO2 removal. Phytoplankton thus plays a pivotal role in the global carbon cycle by removing carbon dioxide from the surface waters. By doing so they reduce the CO2 concentrations in the surface waters, allowing CO2 in the atmosphere to move from a high concentration in the atmosphere to a low concentration in the surface sea water across the air-water interface. ​​Phytoplankton flourish during optimal conditions when there are adequate nutrients, CO2 and sunlight, and will thrive until any of these essential ingredients become limiting. They often form very large blooms, which support the abundance of marine fauna, including extensive global fisheries. Phytoplankton flourish when there is a fresh input of nutrients, such as in areas of up welling, where nutrient rich waters rise up from the ocean depths providing phytoplankton with the necessary nutrients for growth and development. Once all the nutrients at the surface are depleted, the phytoplankton will move to progressively deeper water to utilize the nutrients available there, until they are eventually limited by light availability as sunlight (essential for photosynthesis) cannot penetrate into the deeper nutrient rich layers of the ocean. When this happens the remaining phytoplankton (i.e. the phytoplankton that have not been consumed by zooplankton) die, and sink to the ocean sediments. Furthermore, scientists from the Marine Biological Association and Plymouth Marine Laboratory in the UK and the University of North Carolina Wilmington in the US recently discovered that certain phytoplankton species, the coccolithophores, use calcium carbonate to build elaborate internal body scales for protection, in a similar process that vertebrates use to build skeletal tissue. ​​After assimilating carbon dioxide and calcium carbonate from the surface waters, the phytoplankton die off after nutrients that sustain them are depleted, and they sink to the sediments on the seabed. The scientists concluded that this tiny microscopic plankton are single-handedly responsible for a significant amount of carbon removal from the surface oceans, and contribute on a grand scale to the global carbon cycle. ​​Carbon dioxide dissolves more readily in cold water than in warm water, therefore cold polar water has a higher concentration of CO2 than warm tropical waters. Warm water is carried to the polar regions from the tropics by currents, and as they approach the cooler regions the water becomes colder and is able to assimilate more CO2. As cold water is denser than warm water, the cooler CO2 rich water sinks to the depths and is replaced by more warm water from the tropics. CO2 in the cold water sinks to the bottom of the ocean with the downward flow of cold water, and is carried by deep underwater currents until it surfaces in temperate regions through up welling. This newly upwelled water brings fresh minerals and nutrients to the surface waters and is essential for ocean productivity. When this water reaches the surface the dissolved CO2 is made available to phytoplankton, marine algae and seaweed, and depending on the relative concentrations, some may be released back into the atmosphere. This downward flow and movement of CO2 rich waters from the polar regions to temperate regions is a slow process, and as a very large portion of the global CO2 is stored in the deep ocean waters and sediments, the oceans have been considered a very efficient carbon sink. ​​However, there is growing concern that the oceans are becoming increasingly less effective at performing their role as a carbon sink due to the effects of a warming climate. Scientists from IPSL's OCEAN laboratory have recently analyzed a ten year data set of data collected by the OISO Indian Ocean observation service from 1998 to 2008, measuring CO2 in the Southern Indian Ocean. When compared with historic data, the data from the recent observations show that CO2 is increasing faster in the ocean surface waters than in the atmosphere, and while the concentrations of CO2 are still higher in the atmosphere, they are rapidly becoming more concentrated in the surface waters of the ocean. Similar studies in the North Atlantic revealed that the oceans ability to act as a carbon sink had diminished by 50% over the study period from 1996 to 2005. ​​The scientists conducting this research attribute the rising levels of CO2 in the surface waters of the ocean to a change in weather patterns at high latitudes. This has led to an increase in the relative difference of atmospheric pressure resulting in higher wind speeds that cause turbulence on the surface of the ocean. This gives rise to an increase in ocean mixing as surface waters mix with deep CO2 rich waters. Consequently, CO2 is brought up to the surface from the store of CO2 in the ocean depths. The effect of these higher concentrations of CO2 at the surface of the ocean limits the amount of CO2 that can diffuse from the atmosphere to the ocean, and in effect reduces the ability of the oceans to act as a carbon sink. A weakening ocean carbon sink and a reduction in ocean uptake of CO2 will ultimately result in an increase in atmospheric CO2, further exacerbating global warming. It is imperative that researchers of global warming and climate change take these observations into account in future predictions of the effects of global warming and its impacts on our world, as this is a key factor that should play a vital role in decision making with regard to future CO2 emission control measures in response to global warming. ​Brownlee, Colin, Chachri, Abdul, Goddard, Helen, Taylor, Alison R., & Wheeler, Glen. "A Voltage-Gated H Channel Underlying pH Homeostasis in Calcifying Coccolithophores." PLoS Biology 9.6 (2011). "Climate Change Leads To Major Decrease In Carbon Dioxide Storage." Science Daily (2009). ​​Fay, Amanda R., Metzl, Nicolas, McKinley, Galen A.& Takahashi, Taro. "Convergence of atmospheric and North Atlantic carbon dioxide trends on multi-decadal time scales." Nature Geoscience (2011). ​Meadows, P.S. & Campbell, J.I. An Introduction to Marine Science. Blackie & Son Ltd., 1988. "Ocean Less Effective At Absorbing Carbon Dioxide Emitted By Human Activity." Science Daily (2009). ​​Thomas, et al. "Changes in the North Atlantic Oscillation influence CO2 uptake in the North Atlantic over the past 2 decades." Global Biogeochemical Cycles 22.4 (2008).